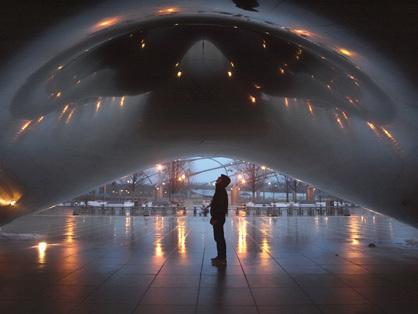 I am a huge fan of the bean in Chicago so these pictures are really cool to me. The top photo is my favorite. I like the lone person in the middle of the photo and the reflection in the top portion of the picture with the symmetry of the lights of the city. I’ve only been to the bean once, but I was instantly in love with it. The smooth, reflective surface is memorizing. I enjoy the fog that slightly conceals the buildings and how the wet ground reflects the city lights. The orange glow from the lights adds a nice contrast to the dreary blues and grays. I think this series has great composition. The symmetry and light in both pictures is great. In the bottom photograph the time of day the photo is taken really gives it a more dramatic feel especially with the lights. The reflections off of the bean especially in the second photo is very visually intriguing. 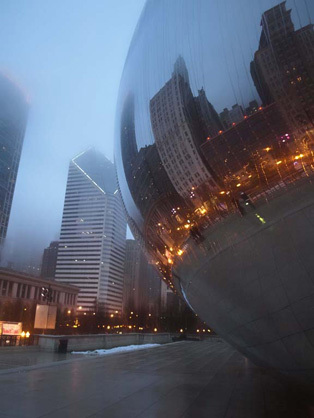 Taking an Art History course this past winter, we learned about the Bean in Chicago. You really captured the beauty of the piece, even if the person has not seen it up close and personal, like myself. Particularly in both photos, the lighting and contrast in color, makes the images pleasing to look at. I also love how there is a sense of a background and foreground, that provide the viewer with a depth of field. The most interesting part of this photo would have to be the skyline scenery off the bean. The reflection of the distorted scenery adds power to these photos. I really like the lines within both of your photos and the reflections that are occurring as well. I like the idea that the viewer has a glimpse of what you’re photographing but that you leave the rest to be the reflections in the object. These images are amazing. I love the way you used the reflections to your advantage especially in the first image with the lights. The light reflections make the image look very ritualistic and yet the reflective material gives a more ufo experience. You did a great job of working with your surroundings. I have seen photographs of the Bean in Chicago before. It is a pretty popular tourist photograph and I think that sort of history is something you need to consider in your own documentation of the subject. Either embrace it or change its context. However, the atmospheric conditions you captured in these photographs is breathtaking. In the first the light reflection on the ground really adds an new dimension to the piece and the foggy condition of the skyline in the second is really beautiful. I think you have a talent for capturing fleeting aspects of a scene that you should defiantly take advantage of in further work. The reflective surface of the Bean really lends itself to great photos. I’m especially drawn to the top photo where the reflection of light on the Bean is complemented by the same lights reflected off of the wet pavement. It is also neat how the person in the photo seems to be looking up in to something so vast. It is reminiscent of something outer space related. I really like these images. I find them interesting because they are not the normal beautiful sunny day images people usually take of the bean. The clouds are very strong and they add a lot to the images. I also think the lights are great. I wish in the top image that the man was directly in the center or more off to the side. These images are beautiful, nice job. The composition in these photographs is great. I love the reflection of the skyline off of the bean. I really enjoy the lighting on this photograph. I would be interested to see more like the top photograph. I really appreciate the way you used reflection in these photographs. I prefer the one on top than the one on bottom. I think the silhouette was a great touch. My problem with the bottom one is that the left corner is a bit blurry. That could just be a foggy day though. I love your use of reflection in these photographs. The curve of the mettle makes the buildings reflection look really interesting. I also like how most of the photo are gray desaturated colors and there are just little hints of orange to make the photo pop. I love the way that light plays a key role i in these photos. The reflections are amazing and have great detail. It makes me want to be there. Maybe go back and reshoot when its sunny. See if that is more interesting. All in all great composition. The way you utilized the rainy/foggy day and the reflective surface is stunning. The great Japanese earthquake had just happened during this year and to think that even though such tragedy was going on, there are still beautiful moments to look at. It is that time of year so I am getting a little emotional but Chicago is also a place that has meaning to me so this picture just gives me the feels. I know it’s not descriptive but that is all I can say right now. I like how you chose to take the photos during the evening and when no one was around, which rarely happens at the Bean. I really like how the lights reflect off of the bean and illuminate the image. I enjoy the first photo the most because of the composition. I think you could think more about composition and the size of the image for the second photo; it looks like it was photographed off of a phone. Overall, good job. I enjoy the contrast the lights have against the foggy grey blue surrounding. I also like how the reflections came out in the photos.